Proposals are a critical element of the sales process. For many companies, writing good proposals is considered as their real source of competitive advantage – a key factor for them to win business. They have a great proposal machine at which proposals are developed efficiently, by teams collaborating effectively in a spirit of creativity and fun. Companies and organizations don’t only compete on the same business opportunities to which they submit proposals, but they often compete with the clock to construct high quality proposals in small amounts of time. 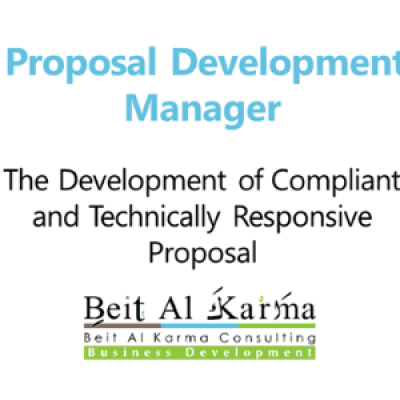 Successful Proposal Managers and Writers know how to deconstruct Requests for Proposals (RfP), identify the project scope, develop appropriate tasks and to smartly story-board their proposed solutions in order to submit proposals that are compliant, responsive and adequate. Clients usually are looking for companies that can conceptualize their ideas in a logical and benefits-driven layout, develop detailed yet complaint proposal outline. Noncompliance is one of the primary ways Clients moves your proposal into the “not worthy of further consideration”. Therefore ensuring compliance with the Request for Proposal is a must. The first day of the course will discuss the proposal management process and proposal team’s functions to lay a good foundation for factors behind successful proposal writing efforts. Then, and against written proposal, participants will go through the techniques on how to smartly story-board their proposed solutions in order to submit proposals that are responsive and adequate. The story boarding techniques will then be completed by the development of a Proposal Outline showing a road-map of the whole proposal document. In the second day, we will go deeply in how to develop a proposal document that is compliant and responsive to RFP evaluation requirements. We will review and go through the most common as well as advanced evaluation factors that are necessary to consider in order to demonstrate that your proposal is the one to be selected and the one which provides best-value-for-money to your client. Proposal compliance outline helps writers produce compelling content, ensures readability and clarity. You will learn the techniques and tactics that are necessary to bring your company to the position of closing a deal with the client. This course is a foundation to intermediate level and is designed for private sector professional and technical service providers such as engineering firms, ICT solutions providers, management consulting companies, advisory services firms as well as not-for profit foundations among others. It is suitable for all practitioners who are responsible to manage and develop a proposal document that is a responsive, compliant and can close a deal. The course will be highly interactive. Participants will work in small groups on an example that will carry through the two days of the course. Presentations, training course materials and hand-outs are in English. Trainers are bilingual: English/Arabic.